Getting kids moving in the age of YouTube and Fortnite can be a mammoth task for parents. That's partly why kids' fitness trackers, like those from Garmin and Fitbit, aim to make exercise a little more fun. Wiggly, available on Kickstarter now for $169, is taking that idea to another level. 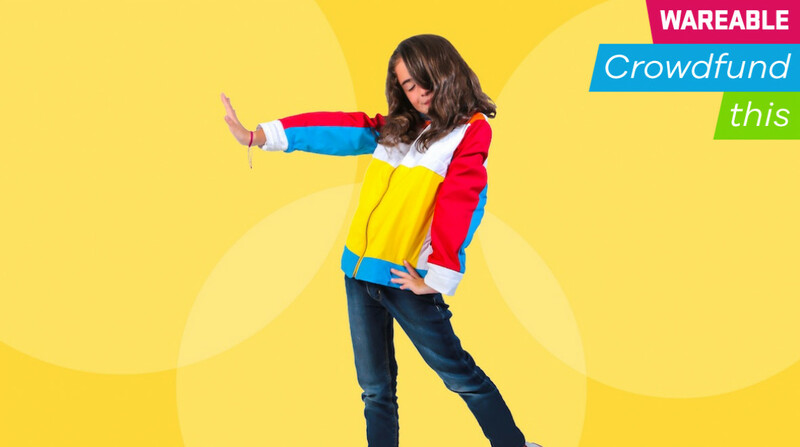 It's a brightly coloured jacket aimed at kids aged 5–12 that is basically a wearable version of dancing video games Dance Dance Revolution or Just Dance. The jacket's embedded speakers play music and bark dancing orders that kids have to follow. If they get it right, the LED lights on the wrist go green; if they get it wrong they turn red. Omar Torres, founder of Wiggly, says the jacket has two gyroscope accelerometers, one in the back and one on the right wrist. Together, they can capture whether a child is completing the dance movements correctly. Movements include raising arms, spinning left and right, jumping forward and back, leaning forward and back and even "doing the wiggly", which is basically a kid raising their arms and wiggling around. No word on whether you can do the hokey pokey yet though. Each song gets progressively harder, and successfully completing a move means having both good form and timing. There's also a congratulatory message after each song, which is basically a verbal high five to tell kids they're doing a good job. There's a companion app on the way that will let kids track their dance progress and create their very own dances, so your kid can add in their beloved floss dance. The jacket, by the way, has a battery life of an hour of continuous play, and you can also plug in your own power bank to keep it going. How do you maintain a wearable jacket for kids, who tend to jump around and get dirty a lot? Well, Torres says the jacket is sweat-proof, waterproof and dirt-proof. But it's not machine washable because detergent chemicals may damage the tech inside, so you'll have to wash it by hand. Torres says he's also looking to create dances for kids with disabilities, so children in wheelchairs and with other ailments can join in the fun. In fact, one of the future features being worked on is being able to link two Wiggly jackets together so that there can be dance competitions. If all of this sounds a little familiar, it's because it is. Torres says he was inspired by a host of old and new games – from 90s darlings Bop-It! and Simon Says to the more recent Just Dance and Dance Dance Revolution. As for the wearable component, that was inspired by Google and Levi's Project Jacquard. Torres looked at all these inspirations, pooled them together and thought they could be used to help kids move. "When you do exercise or play sports you get excited and get happy, and because of that you're more likely to listen to advice or learn or be better so I would like to use that to make kids move," he says. When it comes to wearables for kids, the first question is always privacy. In this case, Torres says Wiggly doesn't track much personal data. There's no GPS or other health data. The only metrics that it plans to track are dance performance, and then there's the information you'll likely have to input to create an account with the eventual app. Torres also says development of the jacket is complete. The Kickstarter funds would be used to manufacture the jacket at scale, though he's also planning on reaching out to outside funding from investors – especially in case the Kickstarter doesn't get funded, which is super likely. At the time of writing, Wiggly has raised $700 of its $41,552 goal. And it's got 15 days to go. That's only from five backers as well, which means it's highly unlikely it will make its goal in time unless there's a massive infusion of interest. Wiggly is also a one-man operation for the most part. Torress seems to be doing everything, from making the jacket to marketing it, with the help of several volunteers and contacts he's made. That, plus the campaign not doing well, may mean you're unlikely to actually get the Wiggly unless it can find outside funding. Still, we like the idea. Taking the ideas of popular games and packaging them into a brightly coloured wearable to get kids to move around is compelling. Unfortunately, this good idea may struggle to make it into an actual product.